We had an early morning flight to Sochi, landed on time and rushed back to the Hotel. Cleared our stuff and were in the car in no time. That was it, and another second we were on the way to the Russia-Kazakhstan border. Well, we had totally forgotten that my Kazakhstan visa was only valid till today i.e. 4th October and ideally we were supposed to be exiting from Kazakhstan into Uzbekistan today! But our touristy side had gotten the better of us, we totally forgot about it and had gone to Moscow. 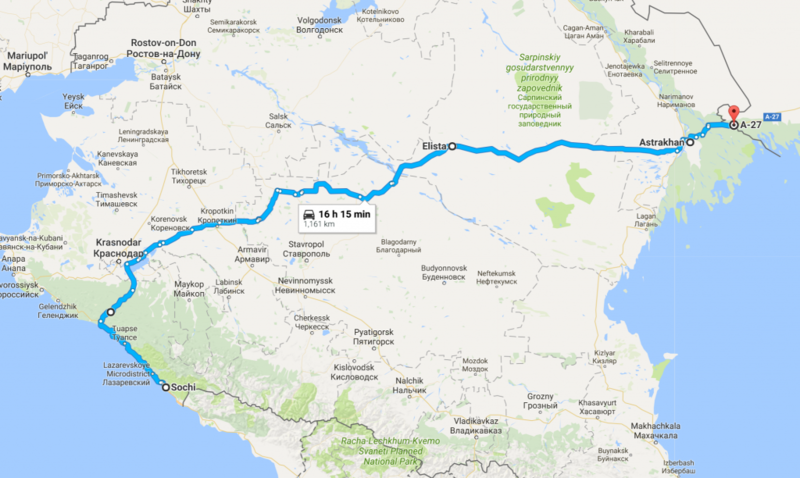 Now, plan was that if we could somehow enter Kazakhstan today, then will figure out the rest. However the ask was a little too much, we have to cover close to 1200 Kms in roughly 14 hours. Was possible if we could have driven non-stop at a speed of 85+ Kmph! But problem was the terrain, it was mostly hilly with speeds max at 50-60 Kmph. In reality, for first 4-5 hours we had really bad traffic, long jams thanks to a marriage in one town on the way. And to make things worse, there was something about the sub we picked up on the way from one Subway and as a result Aarti was feeling sick and we had no other option but to call it a day 5 hours short of the border i.e in a town called Elista. Using our offline GPS, we found one hotel (which seemed more like a hostel). Even thou it was a crappy place but with Aarti’s health and considering the time of the day, we checked in and crashed on our beds after gobbling whatever we could get our hands on. Now, 4th October was gone too. Our master-plan now was to enter Kazakhstan on an expired visa, banking heavily on our dancing skills and Mithun’s photographs! What song of Mithun did Aarti and Akhil dance to at the Russia-Kazakhstan border? Did it work? Did they enter Kazakhstan? Born and brought up in Jammu, India. Did his B.E. in E&C, and M.S. in Software Engineering. Currently working as a Technical Architect.